Make your drive a fun and enjoyable experience by adding one of these high quality, beautifully detailed GMT designed and manufactured thick gauge plastic overhead radio console. These consoles are designed for gas and electric RXV Model EZGO Golf Carts made from 2008 to present that feature a roof with four ribs. Note: This console is designed to fit only the RXV Model's with 4 ribs, not 5, formed by the top. Please see picture above. If you find that you have a 5 ribbed roof, please order from our EZGO RXV Golf Cart with 5 Ribbed Roof page. 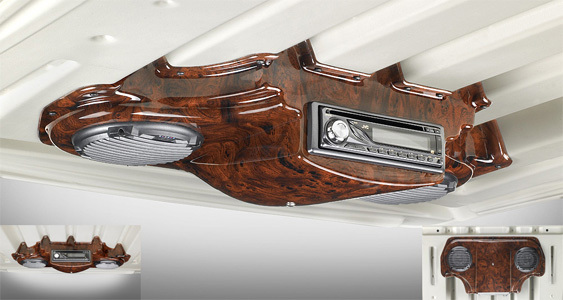 This radio console mounts conveniently to your roof and accommodates a stereo with two 5-1/4" speakers (4-1/8" mounting hole). PRIOR TO ORDERING, PLEASE REVIEW OUR PICTURE ABOVE WHICH CLEARLY SHOWS BOTH TOPS USED ON EZGO RXV GOLF CARTS. THE RADIO CONSOLES WILL NOT INTERCHANGE BETWEEN 4 AND 5 RIBS TOPS. PLEASE ORDER ACCORDINGLY BASED ON YOUR TOP. Hardware kit is included. Due to the extra pre-cut storage compartment hole, this console will extend approximately 6" from the top. We encourage you to do some measuring on your golf cart to ensure that this console will suit your needs. Important Note 1: This console is designed for gas and electric RXV model E-Z-GO golf carts made from 2008 to present with a 4 ribbed roof. If your golf cart or utility vehicle has a long, (approximately 80"), top, please note that this console will not work. This console will not fit the Medalist or TXT Model Golf Carts made from 1994 to present. If you find that you have that model, please see our EZGO Medalist & TXT Radio Console page. SPEAKERS, WIRES AND RADIO ARE NOT INCLUDED.